What Is Norton Secure Online Storage & Why Should You Use It? Well, as the name implies, it's a tool that allows you to save files and folders on a secure internet database. This way, you don't have to spend excessive amounts of time or money backing up your computer with a compact-disc. To use this tool, all you'll need is a secure internet connection and a reliable power supply. The main benefit is the fact that you'll have complete control over the backup procedure including its frequency, location, and selection. It's provided in most versions of Norton 360, and a minimum amount of internet storage usually comes with the product to get you started. View Details: Provides you with a brief overview of the tool. It'll display whether it's been configured yet and when the last backup ran. This part isn't of much use at first, but you'll want to pay attention to it as soon as your backup is all set up. 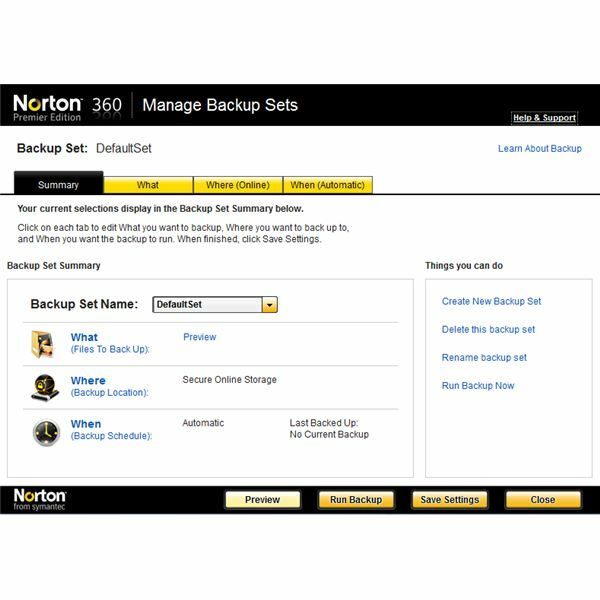 Manage Backup Sets: Provides you with all the customizing options you could ever ask for! This allows you to change what files are backed up, where they're backed up to, and when backups occur. Run Backup Now: Pretty self-explanatory, but it just allows you to manually backup your computer. This is useful if you don't know when you're usually going to be on your computer and can't rely on the automatic scheduler because of it. Restore Files: Allows you to restore files that you've previously saved on your secure internet database back onto your computer. This is what you'll use if your computer suddenly spasms and you lose all your files. Buy More Storage: After awhile you might get those irritating "You have fully used your online storage, please add more" messages. Well, simply put, this is how you get that additional storage. Note that it does cost some money to do so though. Now that you have a sense of what each feature does, the set up process will be far easier. To get started as quickly as possible with this tool, and to avoid any potential frustration, simply follow a few steps. First, click the "Manage Backup Sets" feature from the list and wait for a new window to popup. Next, you’re either going to "Create New Backup Set" by clicking on its respective link, or just customize the pre-existing Default Set. If you decide to create a new one, you’ll need to enter a name like "Test Backup," or similar. It doesn't really matter which route you take, it just depends on your personal preference. Navigate to the "What" tab and browse through the list of files. Go ahead and check the box beside each file you want to backup. Don't be afraid to spend a little bit of time on this part. After all, it's important to select all the files you feel are worthy of backing up. If you rush it, you may end up missing some crucial ones. Just a few more steps and you're done setting it up! Navigate to the "Where" tab and quickly ensure that the "Secure Online Storage" option is selected. Then, navigate to the "When" tab and either set the backup process to run Automatically or change it to a fixed interval. Bear in mind that you can always just opt to run it on a manual basis, so long as you actually do it. Click on the "Save Settings" button in the bottom right-hand side of the window and then close it. That's it! You're all done setting up your backup. What's really cool is that it essentially becomes a "set it and forget it" type of program if you've customized it to run on an Automatic schedule. Norton Secure Online Storage is really a pretty straightforward program to understand. It just takes some initial effort to set up, but once you're done, you don't have to worry about ever losing crucial documents permanently. You might think your hard drive will never get wiped clean, but it happens a lot more often than you think. It's better just to take the precaution and back your computer up than to regret not doing so after the fact.